Taking a bus from KL to Johor Bahru is the fastest and most budget transportation option to travel from KL to Johor Bahru. Reputable and on-time departure coaches plying between the two largest Malaysia cities Kuala Lumpur and Johor Bahru are Transnasional, KKKL, and Konsortium. All southbound coaches from Kuala Lumpur are departing from Terminal Bersepadu Selatan (TBS). The duration required for bus from KL to Johor Bahru is about 4 to 5 hours depending on traffic conditions. 1 washroom break will be provided along the highway resting area. The bus fare for bus from KL to Johor Bahru is priced in the range of RM 30.60 or SGD 20 to RM 75.00 depending on the bus operators. The average fare is around RM 35 which is reasonable. Compared to flight, bus fare is much cheaper. Supernice Grassland and Arwana Express offer the lowest fare at RM 30.60 and RM 31.20 respectively. All coaches are of the executive bus or SVIP bus types which allow passengers to recline their seats to a comfortable level during the journey. The departure point in KL for most a majority of coaches is at TBS (Terminal Bersepadu Selatan), a relatively new bus terminal located at southern part of Kuala Lumpur slightly off the city centre. However, one should not worry because LRT is available to connect you from the city to TBS. Here is a comprehensive guide from TBS to city centre, you just need to do the reverse to reach TBS. Other departure points in KL include Berjaya Times Square and One Utama Bus Terminal for Billion Stars and Five Stars Express, as well as Kajang Bus Terminal which is for coaches managed under Ampurna Impian Resources like 88 Express. The arrival point in Johor Bahru is at Larkin Terminal, the main Johor Bahru bus terminal. Additionally, almost all coaches actually allow passengers to drop off at Sri Putri and Tun Aminah bus stops in Johor Bahru. Passengers will only need to inform the driver in advance while approaching the bus stop. Apart from the conventional internet banking and credit card payment, BusOnlineTicket.com also offers offline payment option at 7-Eleven (limited to Klang Valley only). This payment option allows certain groups of people to book the KL to Johor Bahru bus tickets via cash payment. 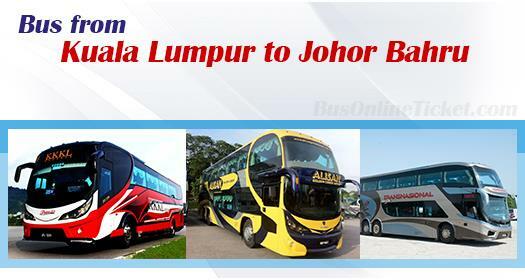 Furthermore, because of the expensive parking rate and heavy traffic in Kuala Lumpur, it is more convenient for passengers to book KL to Johor Bahru bus tickets online in BusOnlineTicket.com to secure your seats in advance.